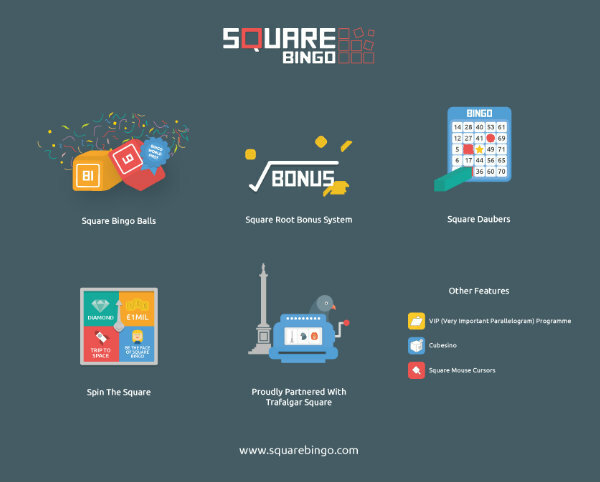 After weeks of anticipation, Square Bingo finally launched on April 1, 2016. Except it didn’t. Square Bingo was actually an April Fool’s Day experiment created by Lindar Media (that’s us) to gauge how the online bingo industry would react to a new, unknown and untested brand. With just a few social media posts and a simple 'Coming Soon' page to the Square Bingo name, we were able to create a small but meaningful buzz among the country’s leading bingo affiliate sites. But what does that tell us? Did a fictitious site shed light on some of the key issues affecting online bingo in 2016, and what did we learn about its treatment of the players that fund it? According to recent statistics from the UK Gambling Commission (UKGC), bingo sites had a Gross Gambling Yield (earnings retained by the operator after winnings had been paid) of £82m between November 2014 and March 2015. With such great rewards available, it is really any surprise that new bingo sites are launched on a monthly basis? Well, we say new, but the majority of bingo sites are simply re-skins of older designs, intended to funnel players from one site to another with the promise of bigger bonuses and ‘original’ themes. We operate a selection of networked sites ourselves and are also guilty of falling into this rinse and repeat cycle. 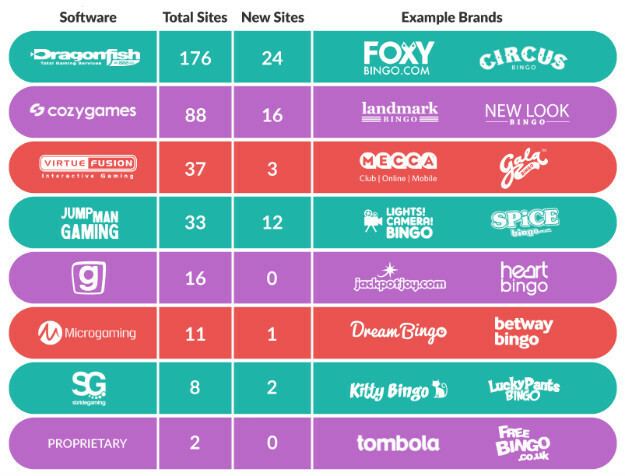 But starting with the launch of Circus Bingo last July, and continuing with Pixie Bingo and Wild Spins, we are now trying hard to put our own unique mark on network software through the creation of distinguishable brands. There’s plenty of room for operators to be adventurous if they want to be. Are players really crying out for another Welcome Bingo? We don’t think so. PlayTech’s bingo variants and Tombola’s proprietary software aside, it has been years since an operator has offered a truly original approach, leading to genuine excitement when something slightly different arrives on the scene. As a precursor to Square Bingo, PlayTech’s newest game, Cash Cubes, highlighted how even relatively simple changes continue to be celebrated as groundbreaking when it launched in March. Then in April we saw 888Ladies launch playing card based, Flash Fives. Both of these games are essentially still bingo at their core; replacing the standard bingo card with a different object and speeding things up a bit. How many more times will this concept be copied? Probably the biggest surprise about Square Bingo was that the domain wasn’t already taken. Square Bingo was no different. We deliberately chose it to be as plain and uninspiring as possible. Other names on the shortlist included Ironing Bingo, Paint Drying Bingo, Car Park Bingo and Grey Bingo. Making Square Bingo look real was actually quite easy. As well as the compulsory ‘Coming Soon’ page, we used a selection of channels to actively build community excitement. “This new site has a brilliant marketing scheme by keeping us all in the dark while at the same time giving us just a tiny bit of information to keep us coming back for more. We have nothing against Tip Top Bingo, it's actually a very nice site, but why bother creating a Twitter account only to let it sit dormant? Fortunately, its Facebook page does a much better job of engaging its audience. 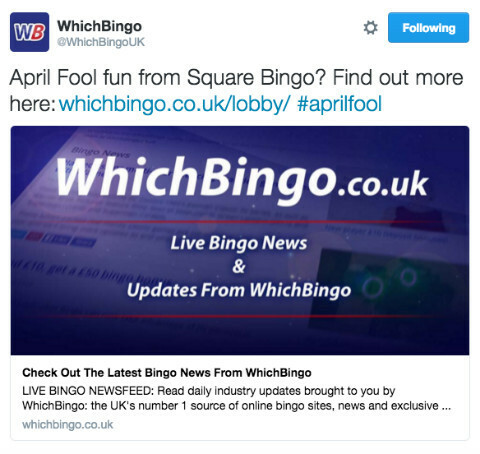 Thanks to our rather basic promotional strategy, we were offered affiliate and advertising deals for Square Bingo in March. Sites were willing to promote an unknown bingo brand with almost no confirmed information about the site. Remember, Square Bingo was to run on a completely new platform (Shapesoft) and be operated by a company that even Google had no record of (CBWFL Media). Would there have been quality checks before our campaigns went live to safeguard players or was their experience being overlooked by the hundreds of affiliate sites desperate to cash-in on their deposits? It would certainly seem so. We updated Square Bingo on the first of April to include a list of (fake) world-first features, including the much-predicted square bingo balls, a spin the square bonus game and an exclusive partnership with a famous London landmark. We sent a version of a press release to hundreds of people in the bingo industry, published news on OnlineBingo.co.uk and Two Little Fleas, and updated the Square Bingo social profiles. We were fortunate that our work in the lead up to 1st April kept people invested in the launch and allowed the scenario to play out in full. The whole thing could have immediately been called out as a joke, so why wasn’t it? Sticking to the traditions of April Fool’s Day, we finally revealed the truth about Square Bingo at 12 noon. Our reveal included a message to affiliates and an exclusive Circus Bingo deposit code, designed to appease any players who felt robbed of a new site. Then, something strange happened: coverage of Square Bingo began to disappear. We were accused of everything from having ‘more time on our hands than we know what to do with’, to conducting a ‘publicity stunt to get new players though the virtual doors of the site’. These were the same people who just hours earlier were outwardly expressing their excitement for the features being teased. We were disappointed (but not surprised) that the exclusive Circus Bingo offer was ignored, despite it being live for a significant part of the day. Many of our affiliates were informed of the promotion, but not one updated their site to let their players know. Surely if sites were truly offering the best deals for players, they would have actually told them about it? Apparently not. People simply turned their backs on Square Bingo because it was no longer a way to make money. 1. The replication of tired experiences will lead to sites failing to build sustainable brands and loyal audiences. 2. Players will eventually resent being funneled between identical sites and flock to those with truly exceptional features, putting smaller sites at significant risk of closure. We don't know when the bubble will burst, but it’s surely only a matter of time, especially given ever-tightening rules and regulations. UK Chancellor, George Osborne, recently unveiled plans to extend the General Betting Duty which would see operators paying tax on free bets like no deposit bonuses. While the plans are still to be confirmed, they have the potential to immediately cut the profits of operators, leading to the possible abolition of bonuses altogether - one of the key differentiators between bingo sites in the current environment. Some sites are already receiving negative feedback from disgruntled players over hefty wagering requirements; how long before they start rejecting them completely? What will attract players to a new site if there is no monetary incentive? This is the question that operators will need to answer. Affiliates are also responsible for driving the industry forward, but very few bingo portals offer genuinely honest and trustworthy reviews of bingo sites. Reviews are instead based on the deals negotiated between sites and brands, leaving players without the insights they need to make informed decisions and making the ratings effectively worthless. Take a look at WhichBingo’s new bingo site page, for example. It contains four sites that don't even offer bingo - Jester Jackpots, Slotahoy, The Grand Ivy Casino and Casino of Dreams. What incentives are there for operators to create a new site of real value when its ultimate quality is determined by affiliate deals and welcome bonuses? Will we only see a rush of new ideas before the general betting duty is extended or will more forward-thinking operators step up earlier? If the bonus culture was suddenly stopped, operators and networks would be forced to condense their portfolios and refocus on just a handful of sites. Building new sites and moving players around comes at a hefty cost, so it makes sense to offer fewer higher quality sites and build a database of genuinely loyal players. Who will take the first step and revolutionise the online bingo scene? 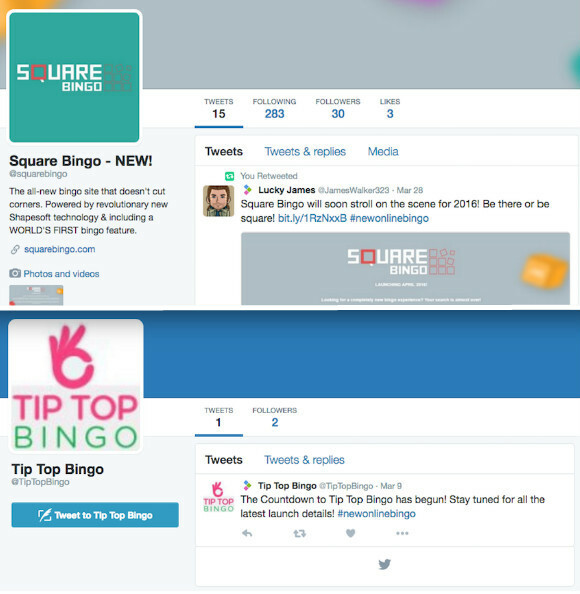 The reaction to Square Bingo and its world first bingo balls highlights just how desperate the industry is for change. We believe that it’s possible for operators and affiliates to provide a better and more rewarding experience for players in a way that remains profitable. We’ve seen huge progress in the industry’s approach to responsible gambling in recent years. That same ideology and determination should be applied here too. If we offer better - and expect better - we could all create an industry that is truly fun, fair and exciting for everybody. This article was written by Lindar Media, operators of sites including Circus Bingo, Pixie Bingo and Wild Spins. 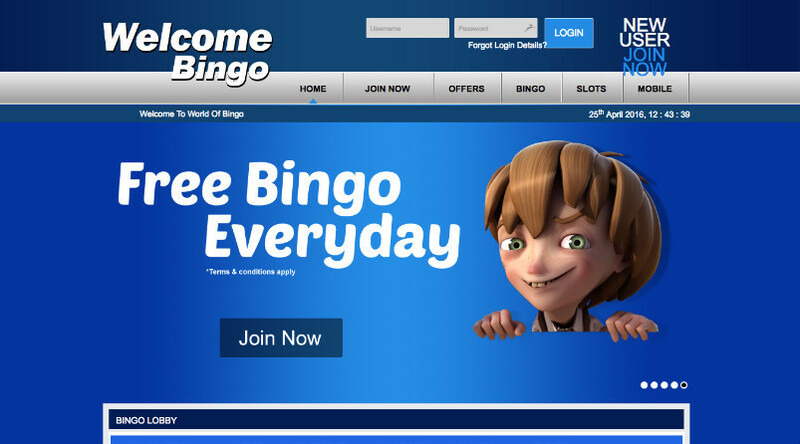 We also manage two affiliate portals: Two Little Fleas and OnlineBingo.co.uk.